Hamlet could use some more content on its own. SW has more content overall, but I think the impact Hamlet has on the entire game is much bigger than Shipwrecked. The insanity of end-game mega bases just increased several fold with The Key to the City and merged crafting. This DLC definitely caters to people who survive for a long time and want to have an end-goal objective with building complex cities. Remember when they first announced Shipwrecked years ago, they said it would be a standalone game that would not interact with regular DS or RoG at all? Then we made our voice heard and they allowed us to world hop with items and stuff under one roof. That was probably the best choice they ever made for this game, since this allowed us to have ALL the DLC in one effective world. The game has definitely come a long way since RoG wasn't even made. You can use pneumatic doors, as a workaround, to push the bottles up and make them fall onto the pplate again. That triggers the weight sensor. I haven't built a Jukebot, Arcade Cabinet, or Espresso Machine yet. It's pretty easy to get Morale into the mid 20s with just Rooms and Decor. Barracks, Plumbed Bathroom, Great Hall is pretty much all you need for quite a long time. Put up Paintings and Statues made from Granite, some Crown Molding, and a few Plants in the Barracks, Rec Room, and Great Hall, and call it good. From that point you should be moving (or have already moved) to an Electrolyzer setup of some description, and be branching out your Power options to start running the ridiculous (though, balance-wise, understandable) power cost of the Jukebot. M8, why so toxic? It’s totally not appropriate here. Is neutronium the stuff under geyers? I thought the whole point of neutronium was to be unmineable? Overlays disable mod by @CarlZalph can help your friend for now if he has a pc copy... Other users and me are bringing these concerns to the devs already with Wagstaff's blur effect and insanity sounds and we hope this will be included too For now pls check that mod in the workshop. I love how we know that Wagstaff is a big player in this game's story, yet it's still not clear how exactly. Obviously his radio's are a big deal and Wagstaff himself knew enough about The Constant to seek it out and get there himself, but everything else about him is a mystery for now. The projection thing also makes the plot thicken even more, suggesting he doesn't exist in The Constant the same way as everyone else. I hope that if he gets added to DST we will learn more about him. hi my take on the matter is that they dont care about ps4 and probably are not going to do anything about this problem, i asked here if they are going to add mouse and keyboard feature to ps4 and no answer . So after having an unpleasant dream about the implications of having to deal with a vegetable for the rest of my life I thought of a somewhat unrelated idea involving the ability for either Maxwell or Wendy to be able to remove themselves from their own body to temporarily have an "out of body experience". To clarify what I mean by this I mean for the player to be able to leave their mortal body behind and take control of a separate entity to perform tasks while their original body continues to exist. For example the player performs this ability and leaves their body behind. The clone will perform a dangerous task and inevitably dies. The only thing that happens to the original body is maybe sanity and/or some health damage. In another scenario if the body dies while the clone is away then you perish like normal. Ideally there would be some more advantages to remote controlling a clone besides pretty much being a portable meat effigy kind of thing like Abigail's original AOE ability, or improved collecting, or a shared inventory between the remote controlled entity and the body. Regardless of what advantages there are to remote controlling a clone there is potential for interesting mechanics. If you've got some thoughts about this idea please do post about it. Reloaded the game around Cycle 420. It happened again around Cycle 450. You can put in an unpowered jukebot. John you are my spirit animal. As mentioned in my Apophenia thread, I'll post the comics with text now. Just a lil' worried about the political aspects but my father said he's trying to be on the fence with his politics when it comes to the comic. My ex-boss was talking on his phone while I was waiting for his orders. He nitpicked the foreshortening on the leg and acted like I didn't know what foreshortening was. I just did this to relax but oh well. Seigfried's wives, the Rhine Maidens. Woglinde, Flosshilde, and Wellgunde. He married them as a promise in his teenagehood after he slayed Fafnir. Despite the promise, he married Brunhilde, and after Brunhilde killed him, they brought Seigfried to Odin so his corpse could be revived. In the League, they act as his bodyguards and secretaries. I won't have enough time to work on artistcrab's reply tonight so here's what I worked on today. If I were to make a simple change to each character it would be: Walani loses no sanity from wetness (and surfboard is faster? Pls?) Wilbur can build Prime Ape huts Warly gains even more health from healing foods. Woodlegs is fine. People who have played him in Hamlet say he is OP, even. Buuuut... Klei has said already there is no team working on SW right now. I mean, that's obvious. But the subtext I take from them saying that is that having the current DS team go back to reprogram some SW stuff would be trickier than it seems. Possible to make a "blurry" widget? 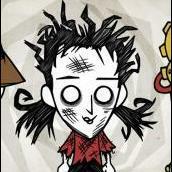 Funny enough, one of the new characters that was just released in the latest Don't Starve Hamlet beta, Wagstaff, has blurred vision outside of the area immediately around him whenever he's not wearing his goggles. If you have the single player version of the game, I'd highly recommend activating the beta and investigating his files as a starting point. This post explains how to access the current beta. Hope this helps!